One of the country’s oldest car makers Hindustan Motors Limited, who are also manufacturing vehicles of Japan’s leading automobile giants Mitsubishi under a technical agreement, has recently launched the all the Mitsubishi Pajero Sport variant. This multitalented and highly praised SUV is from the immaculate family of the renowned Pajero, which is also the winner of the toughest driving contest across the globe, the Dakar Rally. This SUV Mitsubishi Pajero Sport was showcased at a media conference by Mr. A. Sankara Narayanan, who is the Director of Hindustan Motors Limited with Mr. Masahiko Ueki, the Executive Officer and also the Corporate General Manager of the Asian countries and ASEAN office for Mitsubishi Motors Corporation based in Japan. This massive SUV has a lot of fans across the country and globally as well and with the launch of this new version, it is surely going to generate more and more sales for the company. Mitsubishi Pajero Price for the Indian market is starting at Rs. 23.53 lakh (ex-showroom price New Delhi). According to a Mitsubishi Pajero review, this SUV comes with a VG turbo diesel engine and has the ability to make available a peak power of 178 PS in combination with maximum torque of 400 Nm. 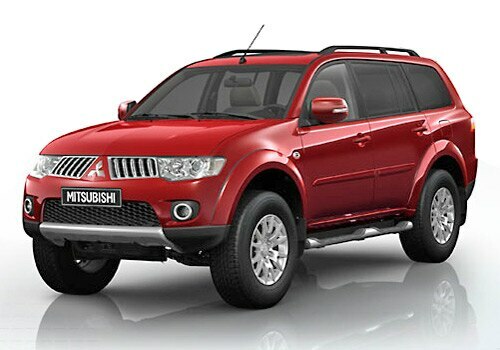 The exteriors of this SUV are classy with a lot of chrome on the front grille, which also houses the signature logo of the company and the broad head lamp cluster combined with a pair of round fog lamps on the bumper complete the front façade as seen in the Mitsubishi Pajero Pictures. This muscular SUV is a sheer delight with a combination of comfortable city driving and the exhilaration of the adventurous off-road driving in the terrains as well and is complete with the gift of luxury, style, safety, power and comfort at all times.